PASADENA >> Police jailed a San Fernando man Friday on suspicion of trying to break into cars outside the Rose Bowl in Pasadena, authorities said. Jason Lamar Buchanan, 27, was booked on suspicion of attempted burglary after officers found him hiding beneath a blanket in a car parked at stadium, 1001 Rose Bowl Drive, according to Pasadena police officials and Los Angeles County booking records. Officers responded to parking lot F of the Rose Bowl after a jogger called police about 8:40 a.m. to report seeing a man trying to break into cars, Pasadena police Lt. john Mercado said. Officers found the suspect, later identified as Buchanan, hiding under a blanket inside a car parked in the lot, the lieutenant said. Buchanan was parked next to a GMC SUV with its handle broken off, Mercado said. But the would-be burglar had not managed to get inside the car. The suspect, who is already on felony probation under AB 109 guidelines, was being held without bail pending his initial court appearance, according to police and booking records. 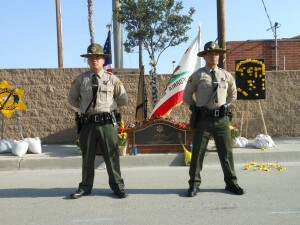 IRWINDALE >> As they have done each year for more than a decade, Los Angeles County sheriff’s deputies on Friday spent 24 hours standing in silent, stoic tribute to fellow deputy David March at the site where he was murdered 14 years ago. 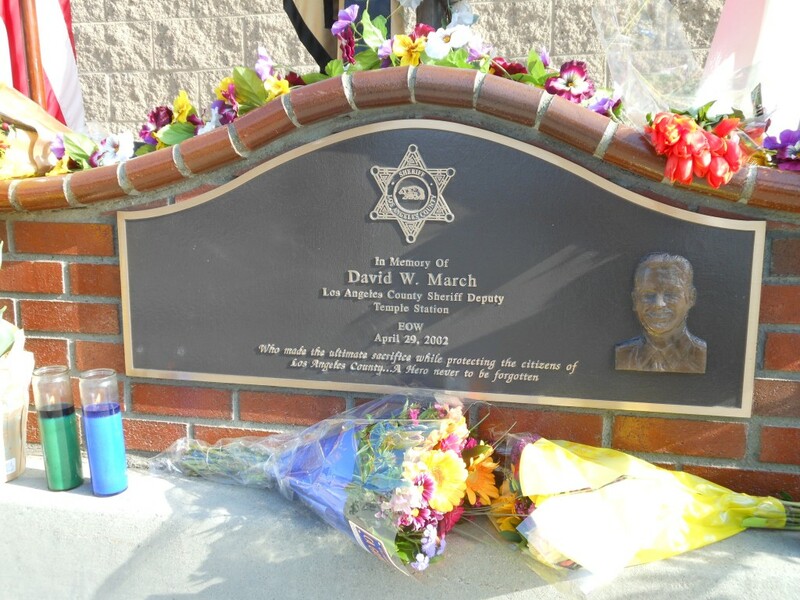 March, a 33-year-old deputy assigned to the sheriff’s Temple City Station, was shot to death in the line of duty on April 29, 2002, along Live Oak Avenue, just east of Peck Road. 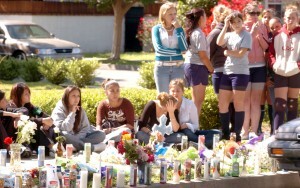 A permanent memorial to March stands at the roadside. 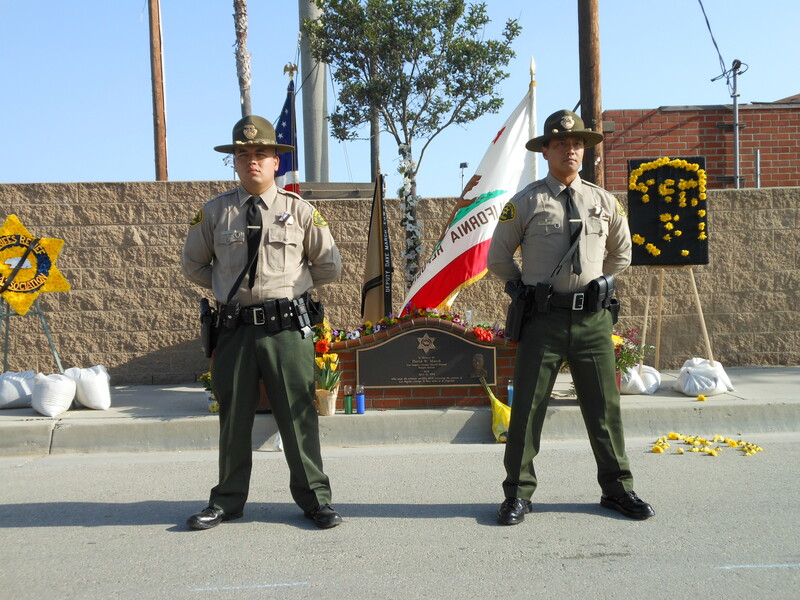 Deputies stood motionless in pairs in half-hour increments before ceremoniously switching positions with two other deputies. The process continued from midnight Friday morning to midnight Saturday morning. Sheriff’s Temple Station Capt. Coronne Jacob and her husband, sheriff’s Sgt. Andy Jacob, took the first shift, Sgt. Jim Dexter said. 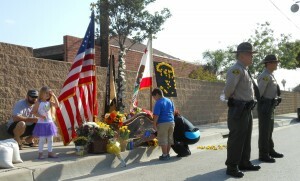 Visitors ranging from family members of the slain deputy to high-ranking officials from the sheriff’s department and other law enforcement agencies stopped by to pay their respects. March’s killer, previously convicted felon and four-time deportee Jorge Arroyo Garcia, also known as Armando Garcia, fled to Mexico within 24 hours of the fatal shooting and remained a fugitive until he was arrested in 2006. Garcia was returned to the U.S. to face trial, and pleaded guilty in 2007 to murder, with the special allegations of intentionally killing a peace officer in the line of duty and using a gun in the crime. He is now serving life without parole in state prison. When Garcia was returned to the U.S. to face justice, deputies cuffed him with March’s handcuffs. 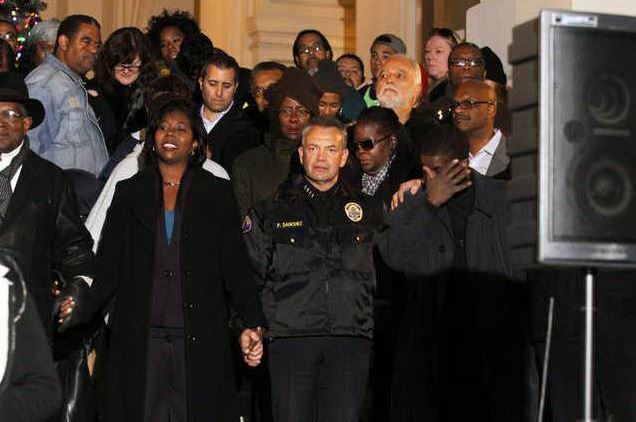 PASADENA >> After more than two weeks of deliberations, a jury convicted to gang members Friday of murder and other charges for fatally shooting a community coach and sheriff’s employee with an errant bullet intended for a rival gang member on Christmas Day, 2012. A Los Angeles Superior Court jury found Bloods gang members Larry Darnell Bishop, 23, of Chino and Jerron Donald Harris, 28, of Pasadena, guilty of first-degree murder for the death of Victor McClinton, 49, of Pasadena, Los Angeles County District Attorney’s Office spokesman Ricardo Santiago said. The verdict followed a mistrial last year and came, “after 15 days of court deliberations.” Santiago said. In addition to first-degree murder, the jury also found true the special circumstances that the killing was gang related, and that the shots were fired from a moving vehicle, Santiago said. The jury also found that Harris personally used a firearm in the crime, but did not find true the prosecution’s allegation that Bishop also fired a gun in the killing. Both men were also found guilty of one count of attempted murder each, Santiago said. The jury convicted Harris of shooting at an occupied dwelling, but acquitted Bishop of the same charge. Though the special circumstances in the murder made Bishop and Harris potentially eligible for the death penalty, prosecutors did not seek capital punishment in the case, Santiago said. They were expected to be sentenced to life in prison without the possibility of parole when they return to court for sentencing July 15. 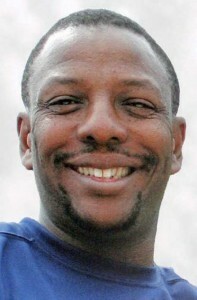 McClinton, a father of two who worked as a law enforcement technician for the Los Angeles County Sheriff’s Department and founded the Brotherhood Community Youth Sports League in Pasadena, was walking down the street in the 1900 block of Newport Avenue about a 11 a.m. with a Christmas gift in-hand when the shooting occurred, according to police and prosecutors. Harris and Bishop spotted, then opened fire on, a rival gang member, officials said. The intended target was wounded. McClinton was struck by a stray bullet and succumbed to his wounds at a hospital a short time later. COVINA >> A routine traffic stop in Covina late Thursday led to the seizure of two assault weapons, as well as the arrests of an Arcadia man and Glendora woman, officials said. 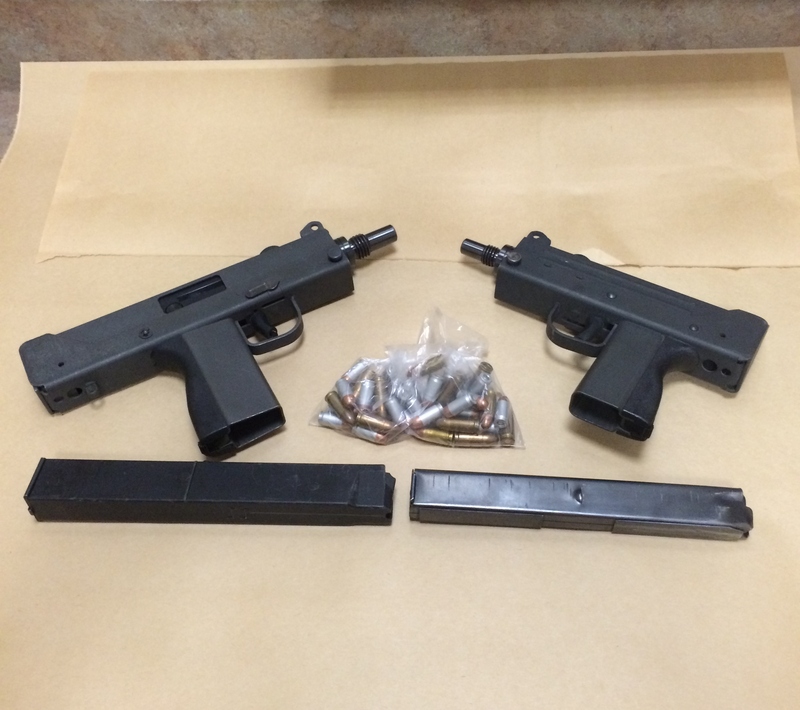 Officers recovered MAC-11 and MAC-12 machine pistols after pulling a car over shortly after 8 p.m. near Vincent Avenue and Arrow Highway, Covina police Lt. Tim Doonan said. Police also recovered a small amount of methamphetamine and arrested the driver, 26-year-old Bryan Beljak of Arcadia, and passenger Amber Blakesley, 18, of Glendora, the lieutenant said. An officer stopped a car for a traffic violation and noticed Beljak, a convicted felon, and Blakesley both appeared to be under the influence of drugs, Doonan said. While searching the car, police found a MAC-11 9mm machine pistol and a MAC-12 .380-caliber machine pistol, Doonan said. Both are classified as illegal assault weapons in California. Police also seized ammunition and two high-capacity magazines from the car, he said. Beljak was jailed on suspicion of possession of assault weapons, being a felon in possession of firearms and being under the influence of a controlled substance, Doonan said. He was not booked for DUI as the investigation continued late Thursday. Blakesley was booked on suspicion of being under the influence of a controlled substance. Beljak was being held in lieu of $50,000 bail pending his initial court appearance, while Blakesley was expected to be released from custody with a citation, Doonan said. INDUSTRY >> An arson fire scorched an Industry warehouse packed with paper goods Wednesday, authorities said. The fire was first reported about 2:45 a.m. at a 55,000-square-foot warehouse in the 700 block of South 5th Avenue, Los Angeles Count fire and sheriff’s officials said. Though largely “kept in check” by the building’s sprinkler system, firefighters battled the stubborn blaze for nearly two hours until it was declared extinguished, Los Angeles County Fire Department Inspector Randall Wright said. No injuries were reported. But firefighters determined the scene of the fire appeared suspicious and called in investigators from the Los Angeles County sheriff’s Arson-Explosives Detail, Wright said. “The cause is arson,” sheriff’s Detective Cynthia Valencia said. It appeared the arsonist spread gasoline around in the rear portion of the warehouse before lighting it on fire. The intent of the arsonists appeared to be to destroy the building, but they were thwarted by the businesses’ fire-suppression system, she added. “(The) sprinkler system did a great job,” Valencia said. Preliminary estimated of the damage cause to the warehouse, as well as the paper plates, paper cups and other similar items stored inside ranged between $300,000 and $500,000, the detective said. A subleased portion of the warehouse, which is used as a packaging business, was unscathed, she said. Investigators continued seeking clues Thursday, and trying to determine who would want to torch the warehouse, Valencia said. The arsonists were described only as two men, driving a sedan. “The owner is very cooperative,” Valencia said. Firefighters remained at the scene until about noon, Wright said. Any witnesses, or anyone who saw anything suspicious early Wednesday morning is asked to contact Detective Valencia at the sheriff’s Arson-Explosives Detail at 323-881-7500. Tips may also be submitted anonymously to L.A. Regional Crime Stoppers at 800-222-8477. PASADENA >> Police are seeking a homeless man who stabbed another homeless man in the face late Tuesday. The attack was reported about 9:30 p.m., when a bleeding 63-year-old homeless man arrived at Union Station Homeless Services, 412 S. Raymond Ave., Pasadena police Lt. John Mercado said. Union Station personnel first called 911 after the man showed up, apparently bleeding from his neck, the lieutenant said. Police and paramedics determined the victim had been slashed in the jaw, the lieutenant said. He was treated for the injury, which was not considered to be life-threatening. It was not clear where the stabbing occurred. The victim described his attacker as a fellow homeless man in his 50s, however a detailed description was not available, Luna said. The motive also remained unclear Wednesday. 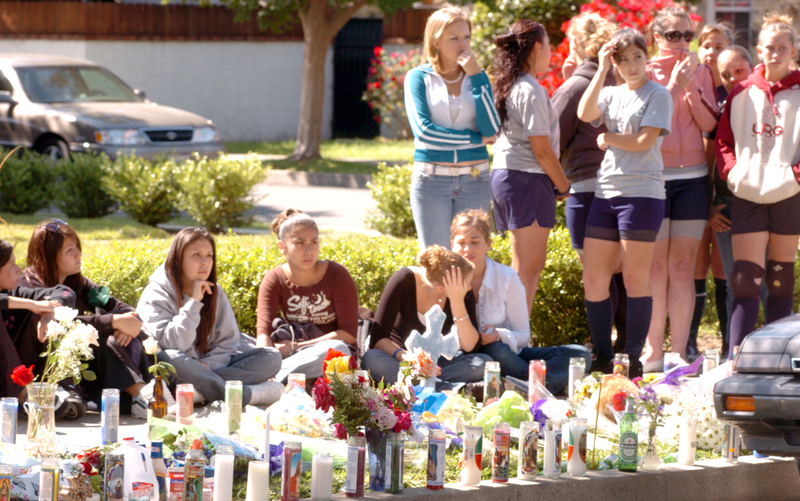 Ryan Dasalla, 17, of Rosemead (left) was shot to death near Gabrielino High School in San Gabriel on April 27, 2005. Daniel Guerrero, 29, of Rosemead (right) is on trial for the allegedly gang-related, mistaken-identity shooting. (Courtesy) Two other defendants, including Guerrero’s brother, have already been convicted and sentenced in the case. 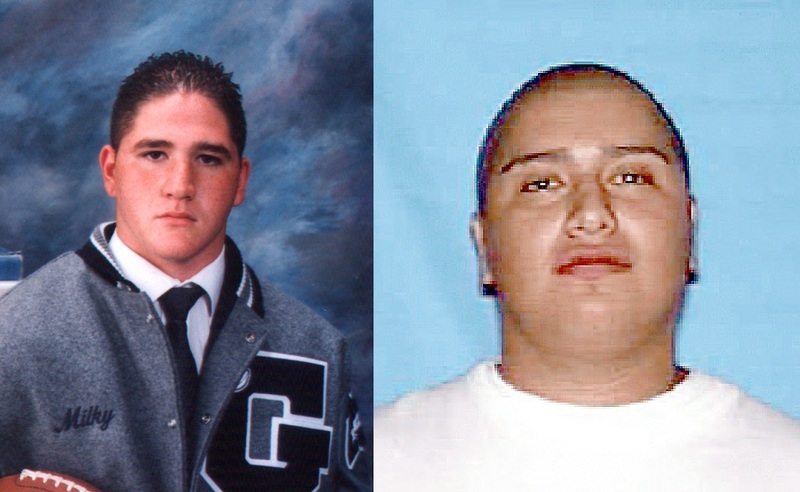 PASADENA >> Trial is ongoing in Pasadena for a Rosemead gang member accused of murder in the mistaken-identity murder of a 17-year-old Gabrielino High School student in San Gabriel, which occurred 11 years ago today, authorities said. 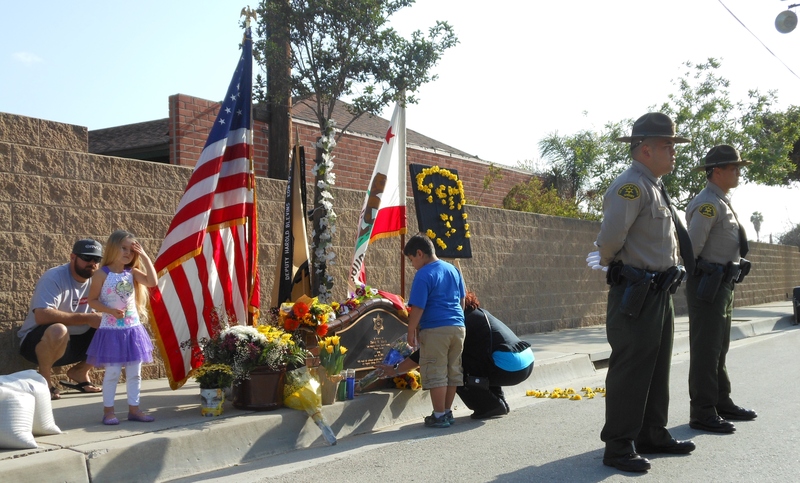 Prosecutors made their case and continued calling witnesses Wednesday in Pasadena Superior Court in the trial of Daniel Guerrero, 29, in connection with the April 27, 2005, slaying of Ryan Dasalla, court officials said. Guerrero, who was 18 at the time of the killing, along with then-23-year-old brother Daniel Guerrero and accomplice and fellow Varrio Nueva Estrada street gang member Sarah Toledo, then 17, shot and killed Ryan Dasalla in a case of mistaken identity, prosecutors said. Toledo helped the brothers target Dasalla under the wrong belief that he was part of a tagging crew that had beaten up the Guerreros younger brother the night before, according to prosecutors and Los Angeles County sheriff’s homicide detectives. Dasalla was shot in the back. Gabriel Guerrero and Toledo were arrested shortly after the fatal shooting, which took place about a block away from Gabrielino High School. But the alleged triggerman, Daniel Guerrero fled and remained a fugitive until late-2013, when he was reportedly found and captured in Tijuana, Mexico, where he was living under an assumed identity. He now faces charges of murder and conspiracy to commit murder, district attorney’s office spokesman Greg Risling said. Records show jury selection in the case began April 4, and opening statement began April 20th, he said. The other two defendants have since been convicted and begun serving lengthy prison terms. Gabriel Guerrero received a sentence of 84 years to life in prison after a jury convicted him in 2010 of first-degree murder, and found true allegations the crime was gang-related and involved a gun. Toledo received 50 years to life in prison in late 2011 after being convicted of murder and conspiracy to commit murder, along with gang and gun enhancements. WEST COVINA >> A car thief led police on a chase through West Covina late Sunday before heading the wrong way on the 10 Freeway, abandoning the stolen car on the freeway and escaping into Covina Hills, authorities said. An officer spotted a stolen car just before 7 p.m. in the area of Azusa and Vine avenues, West Covina police Lt. Travis Tibbetts said. The driver refused to pull over, initiating a chase. Officers chased the Honda Accord as it got onto the eastbound 10 Freeway, exited at Barranca Street, then re-entered the freeway heading the wrong way in westbound lanes, the lieutenant said. Police cancelled their pursuit as the suspect entered the busy freeway heading in the wrong direction, he said. They soon found the car crashed into the center divider west of Via Verde, Tibbetts said. But the driver had continued fleeing on foot, north across freeway lanes and into the Covina Hills. Police and CHP officers searched for the suspect, with help from a helicopter, but he suspect was not found. A detailed description was not available. PASADENA >> Police jailed a robbery suspect Sunday after he led officers on a car chase, then climbed onto the roof of an apartment building before ultimately surrendering, officials said. Officers received a report of the “strong-arm” robbery of a woman about 10 a.m. in the 1500 block of West Colorado Boulevard, Pasadena police Lt. Jesse Carrillo said. The woman’s purse and cell phone had been stolen, he said. It was determined that the robbery took place across the city border in the jurisdiction of the Los Angeles Police Department. Further details regarding the robbery were not immediately available. Pasadena police spotted a car matching the description of the robber’s vehicle 10 to 15 minutes later in the area of Lincoln Avenue and Washington Boulevard, the lieutenant said. The driver refused to pull over, kicking off a pursuit. Police chased the suspect to the 100 block of East Orange Grove Boulevard, where he abandoned the car and fled into an apartment complex and climbed onto the roof of a building. After about an hour, officers persuaded the man to climb down and surrender, Carrillo said. SAN GABRIEL >> Police, firefighters, emergency medical technicians and witnesses took up a collection to help a single mother who was dragged 20 feet by a pickup truck while being robbed of her purse in San Gabriel Saturday, officials said. The crime took place about 10:45 a.m. outside a dry cleaning business in the 400 block of West Las Tunas Drive, San Gabriel police Lt. Riki Nakamura said. A 36-year-old woman stopped into the dry cleaning shop as her 7-year-old son waited in the back seat of her car. The boy was dressed in a costume, as the mother and son were planning a trip to the movies to see The Jungle Book before heading to lunch. The woman saw a man approach her car and open a door, the lieutenant said. Fearing her son was in danger, the woman ran out to confront the man, he said. The robber grabbed the woman’s purse from the front passenger seat of her car and fled to his own vehicle, a pickup truck. Nakamura said the victim clung to the truck as the robber accelerated. The woman fell from the vehicle, tumbling in the roadway, before the suspect sped away, Nakamura said. She suffered injuries to her arms and legs, but declined to be taken to a hospital. Despite her injuries, and the loss of her money and other personal belongings, including their movie tickets and Souplantation gift card, “She was more worried about breaking a promise to take her son to the movies,” the lieutenant said. Touched by the scene, police officers, firefighters, EMTs and passers-by who witnessed the incident took up a collection to present to the woman, Nakamura said. They presented the mother and son with tickets to the same theater they were planning to attend, as well as extra money for popcorn or lunch. Though sore and healing from deep abrasions and an injured knee, the mother said she was recuperating well Sunday. Her son was also doing well, though she said the incident left him a bit nervous. “He’s a little afraid now where he’ll stay with me. He doesn’t want to leave me,” she said. She planned to seek counseling for him. The youngster also told his mother he was worried because he feared the “bad guy” now knows their home address from the items stolen from his mother’s purse. But despite Saturday’s ordeal, the mother and son made it to the movies as planned, the grateful mother said. With her family in Northern California, and while dealing with financial challenges, the woman said the kindness of strangers made her not feel alone following the frightening incident. Police and the victim described the robber as a Latino man in his 40s, about 5 feet 6 inches tall, 130 pounds, with a dark complexion. He drove a lowered, orange or copper pickup truck, possibly a Chevrolet Silverado, with dark tint on the windows. The truck’s paint was very shiny and clean. Anyone with information is asked to contact San Gabriel police at 626-308-2828.